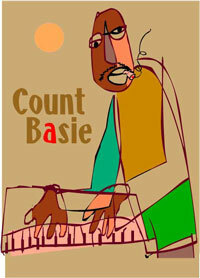 The Count Basie Biography introduces us to a happy cat who simplified piano playing in jazz to make it "playful"! William “Count” Basie has had such a widespread influence, it can be heard in virtually every big jazz band to date. The cat had a way of tickling the ivories and winking at you at the same time...The Count Basie Biography also shows us the dude made his creativity on the piano seem effortless! Basie was first noticed on the scene when he joined Bennie Moten’s Kansas City Band. They were developing a new sound in big band jazz; A style that was simpler than that of Duke Ellington or Fletcher Henderson. It used short phrases called “riffs” exchanged back and forth between sections. This Call and response method of playing left plenty of room for soloists to be highlighted and many different disciplines of jazz and blues to find a place in the big band sound. Count Basie’s piano style fit this incorporation perfectly. His "simple" way of playing made the music appealing to the ears! He first learned to play piano in his hometown of Red Bank, New Jersey. Basie’s first influences were Earl Hines, Teddy Wilson and Fats Waller. These musicians shaped his minimal style. He then joined the vaudeville circuit in New York, playing the thumping stride style accompanying the show. By smoothing out the syncopated thump of this style, he further advanced his own. In 1927, Count Basie got a job playing piano accompaniment to silent movies. THE CAT WAS ADVENTEROUS BY INCORPORATING ALL THESE DIFFERENT PLATFORMS! He then joined Walter Page’s Blue Devils and from there along with several other members joined Bernie Moten’s Kansas City Band. When Bennie Moten passed away in 1935, Basie formed his own 9 piece group, Barons of Rhythm, that included tenor saxophonist Lester Young and drummer Jo Jones. Through live broadcasts from the Reno Club, they attracted quite a bit of attention. People would hear this Kansas Cit style and dig the music! Something was going on out in "K-City"! Their style was a powerful swing, intensified by Basie’s frequent playing with the rhythm section alone, giving the band a unique sound and identity. This raised Basie’s stature in the community onto an even keel with Duke Ellington, earning him the nickname “Count”. Initially, his band didn’t cause much stir when booked for a run at Chicago’s Grand Terrace, but by expanding to 15 members before his next engagement at New York’s Famous Door on 52nd Street, the band took off. Though their early efforts were rough, their exuberance and enthusiasm attracted audiences in droves. Drawing his early repertoire from Fletcher Henderson and the Mills’ Blues Rhythm Band, his simple riffs shot through with blues, combined with Jo Jones’s lighter, cymbal oriented drumming , loosened the beat and put the emphasis on Page’s steady bass and Basie’s swinging piano. In 1950 Basie and his band called it a day, due to the strain WWII put on big bands, but by 1952, he was back in the game. The boy just could not sit still! He was a master of the big band and the audience loved him! He played in an orchestra that included saxophonists Frank Foster and Eddie “Lockjaw” Davis, trumpeters Joe Newman and Thad Jones and the eloquent, rugged blues singer Joe Williams. This group played backup to many legendary performers such as Tony Bennet, Frank Sinatra, Sarah Vaughan, Bing Crosby and Sammy Davis Jr. William “Count” Basie continued to play through the 60’s and 70’s. He played right up into his 70’s, though the cat had varied illness, he was still strong and innovative at the key board until his death in April of 1984! This is one of the rare old jazz cats that said "no" to drugs and he had a long career! Back to Count Basie Biography and other Jazz Cats!